My hopes and dreams for zucchini bread, zucchini relish and yummy stir fry after stir fry were dashed when I noticed the ends of the zucchini in the garden were soft and mushy. A quick Google search revealed that my poor plants have blossom end rot caused by a calcium deficiency. Oh no! I pulled off the damaged fruit and treated the plants with an organic fertilizer. Next up will be some pulverized egg shells in the soil around the plant for a boost. Hopefully the next round of zucchini will fare better. 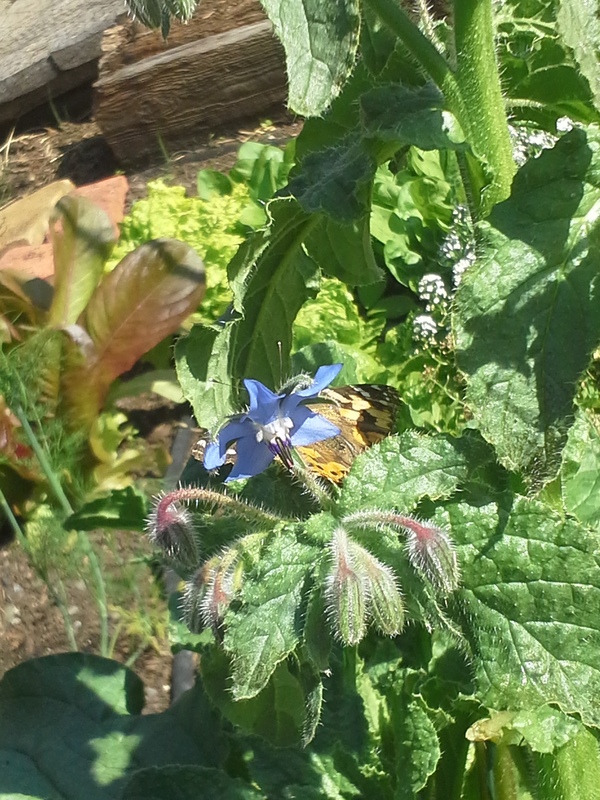 My giant borage plant is attracting lots of bees. buzz buzz buzz. And, butterflies. And, my dream of a shelf stocked with tons of pickles may be on hold until next year as well. My cucumbers aren’t producing like I wish they would. It could be too early for them yet, but I’ve only had a handful of cukes from about 10 plants. I’ll never be able to pickle much at this rate! Cucumber plants need bees to thrive and create cucumbers, and luckily the borage lives next to them in the garden is attracting bees like crazy! So, there’s hope. Perhaps August will be their month. If it’s any consolation, the borage flowers give my water a nice, refreshing cucumber taste when they’re frozen in ice cubes, which will have to do for now.